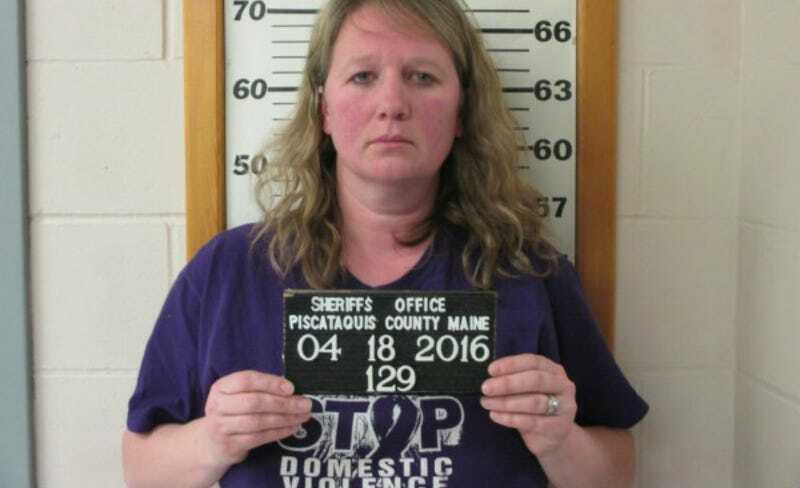 This week in the bad kind of irony, a woman was arrested for menacing her husband with a gun, accused of firing it in their bedroom while they argued. She posed for her mugshot wearing that deeply unfortunate“Stop Domestic Violence” t-shirt. The Smoking Gun has the story of Emily Wilson, from Maine, who is now being charged with two counts of domestic violence: reckless conduct with a dangerous weapon and assault. The Bangor Daily News reports that prosecutors allege Wilson, 38, got into an argument with her husband in their bedroom on April 18 about whether he was having an affair. During the fight, she’s said to have waved a loaded .45-caliber handgun before firing a shot into the mattress of their bed. She’s also accused of grabbing his wrist during their fight. Wilson is evidently a social studies teacher at a local high school. If convicted on the reckless conduct charge, she faces up to five years in prison and a fine of up to $5,000. Domestic violence assault carries a penalty of up to a year in prison and a fine of $2,000.